Stock up at your friendly, local hardware store. Bowser's Local Hardware and Building Supply has everything you need for construction, DIY, and home improvement projects. We've been serving our community since 1946, and we're proud of our reputation for high-quality products, affordable prices, and great customer service. Come to our store, and discover our selection for yourself. Stock up on hardware, building supplies, and household essentials at Bowser's Local Hardware and Building Supply. 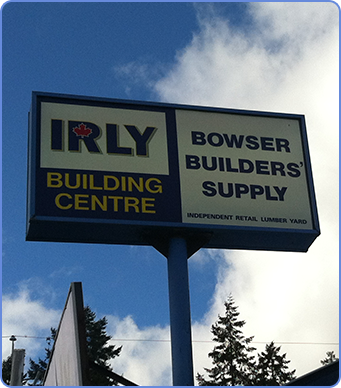 Bowser Builders' Supply is a construction supply and hardware store based in Bowser, British Columbia, on Vancouver Island. We work with many of the industry's top manufacturers and maintain an extensive list of local suppliers and construction providers. Our goal is to be your local resource for construction services. We are a member of the Building Supply Industry Association (BSIA) and Timber Mart™. We are also an Irly Building Centre™, which makes special orders and deliveries easy! We are a small store with a big selection. Our knowledgeable staff members are here to help you find the products you need as quickly and efficiently as possible. If you need help finding anything, just ask. We're always happy to provide guidance and advice. Bowser Builders' Supply is a customer-oriented business that is very active in the community. We are proud supporters of our local community center, schools, and community initiatives. We also sponsor a fireworks display every Halloween, a local chess tournament, and our local wood carving competition. We are located next door to the Bowser Legion. A 20-KM Radius from Bowser, BC, including Fanny Bay & Horne & Spider Lakes.